I love to garden and grow vegetables. I have to plant in containers where I live and have been trying out all sorts of neat ideas for container gardens. The self-watering pots made from two liter soda bottles are great but they aren't really big enough for some plants. They are great, however, for herbs, lettuce and starting seeds. I wanted to plant some seeds for my fall garden. I decided that this would be a great time to try out several methods of making the pots and see which one worked best. I happened to have three soda bottles just waiting to be used. The first pot was simply made from drilling holes in the cap and around the neck of the bottle. That was pretty easy. The second one was made using a wick of paper towels pushed through the neck with the cap removed. I took a paper towel and folded it in half, and then in half again. I then folded it in half the long way. I rolled it into a tube. I spread out a second paper towel and placed one end of the tube in the center of the second towel. I loosely folded that towel up around the tube and pushed it down about halfway through the neck of the bottle. That's easier if the top third or so of the bottle is already cut off. Then I spread the paper towel in sort of a funnel shape and added soil. I've added a video below since this is a lot easier to do than to explain. The third one had one hole in the cap with a wick made from yarn. (Cotton string was suggested too.) I simply poked a single hole through the cap and threaded some yarn through. One end of the yarn lies in the water reservoir. The other end is fed up through the soil. I cut drain holes about an inch or two up from the bottom of the bottles. There were several methods of filling the water reservoir. I just decided to make the drain hole big enough to pour water into it when it needed filling. All three bottles where cut off just below the shoulder of the bottle and the cap end was inserted in the bottom of the bottle, neck down. Soil was added and the bottle was watered from the top to get things started. When the water drained down, I planted the seeds and waited to see what would happen. While I was waiting, I looked for a way to water my bigger pots when I was away. I looked up watering spikes but they came with mixed reviews. And being low on funds, I didn't want to spend the money for the better ones. I came across a simple way to use my favorite recycled item - a soda bottle. It really sounded too simple and I wasn't at all sure it would work. I tried it out on my thirstiest plant, my ivy. If I didn't drench it every day it was really not happy. To make this waterer, poke one, and only one, hole in the cap of the bottle. 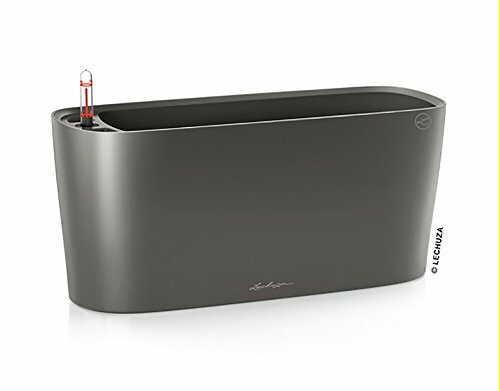 Fill with water. Screw on cap. Shove the bottle cap an inch or two in the soil. It can lean against the edge of the pot for additional support. The plant will just about hide the bottle. I didn't see how it could possibly work since it would create a vacuum in the bottle. To my surprise, it works great. The water level in the bottle has slowly dropped over several days. The soil is not soaked, but it's not dry either and the ivy seems quite happy. I'm making more of these. I checked my seeds after being away for a long weekend. They had all sprouted and were looking great. I planted three different plants so I didn't judge by the growth but by the water left in the reservoir. All three bottles were still wet at the bottom, the soil was still damp and the plants were growing like crazy. Note: I did have algae growing in the water reservoir. I've read that it's a good idea to cover the lower half of the bottle with paper, tape or paint. My conclusion after running this experiment is that all three methods work equally well.I could not see any difference at all in the three bottles.. 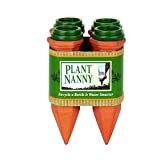 While there may be more efficiency ways to start seeds for a large garden, these bottle pots are perfect for my needs. If you have to travel or just get too busy to keep an eye on seedlings, you might find it works for you too. I've had the water run out too fast, but I've read that even the ones you buy aren't all that reliable. There are other ways to wick water into a pot. Maybe take a look online. Good luck and let us know how you make out. The plant was a basil. It was kind of droopy but it recovered fast afterwards (when I watered it a little bit more). It's been sometime since that happened. Next time that i'll have to leave them like this I'll certainly keep more detailed info to see how it works out. Mike was the plant droopy? Did it really not get enough water? I read something that the dry soil would wick the water out and that's how it's supposed to work. I don't totally understand it myself, but my ivy seemed to do well even when the bottle was still mostly full. Thanks so much Kathleen. Hope it works for you. We finally have had rain here so my little garden is growing by leaps and bounds. These are great ideas, thank you! I think I will try them next time I go away for a couple of days as I have plants on my balcony and they get full sun most of the day. I like your photographs too. You're welcome. What happened when you tried it? I have tries the first option once but it didn't work out as a expected. Thanks for these nice experiments and for sharing your own experience. I didn't think them all up. I just experimented with ideas that are already out there. Just looking for the best way to go about this. These are such good ideas. I'm always quite in awe of your creativity!